History cites the pesto in Genoa in the early years of 1800. Yet the basil sauce, sometimes with marjoram and parsley, had to be earlier than that date as the wrought that the farmers and the people already made to flavor soups or pasta or mix it in the dough to make tasty pies. It was cheap and it was tasty. 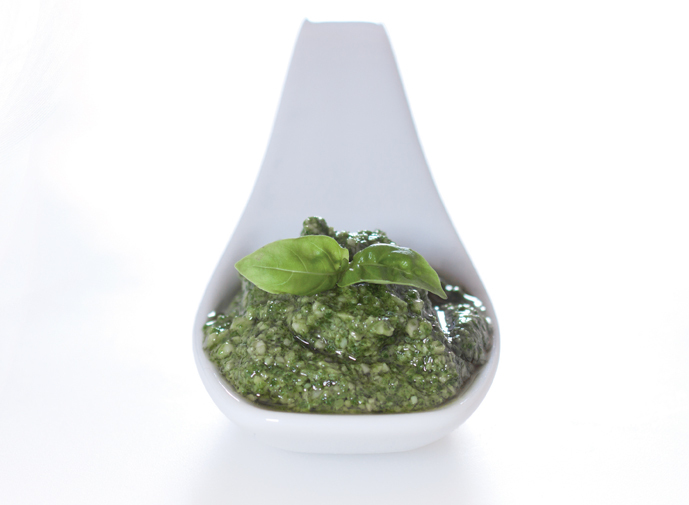 Today the pesto recipe, embellished by its ingredients is a unique delightfulness, which is eaten and appreciated all over the world. PestoandCo selected between different Italian manufacturers an IQF frozen pesto, made with PDO ingredients that respect the original recipe, the unique taste of this special sauce which is very versatile due to an ideal format to suit different preparations and creative inventiveness of each chef. It is in fact produced in pellets of 1 gr dimension, it is ideal for many different uses not only for pasta dressing, but also to flavor dishes of local gastronomy. Prepared and frozen in the same day - every process carefully respects the cold chain to provide a frozen product, fresh as just prepared.